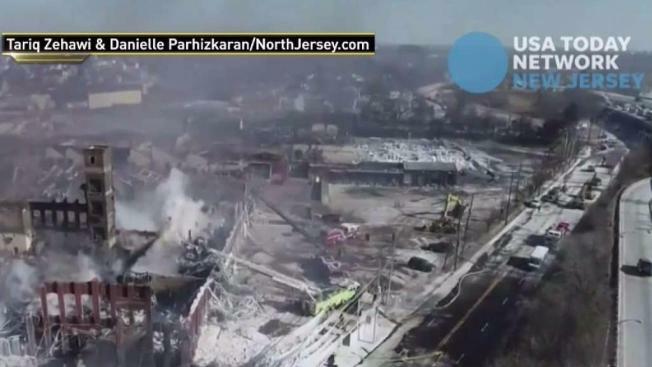 Incredible video shows the aftermath of a massive fire at a New Jersey paper mill. John Chandler reports. Firefighters remain battling a seven-alarm fire more than 12 hours after it engulfed a New Jersey paper mill Wednesday in the freezing cold as the blaze sent smoke and flames billowing into the air that could be seen for miles, authorities said. The fire broke out inside a warehouse building at Marcal Paper Mills, on Market Street in Elmwood Park around 5 p.m. Wednesday, officials said. The water used by firefighters was quickly turning to ice as the sub-zero wind chills devastated the tri-state area. The building houses a number of paper products, including large paper rolls, Elmwood Park Office of Emergency Management Chief Michael Foligno said at a press conference. The roof of the building collapsed not long after the fire started, he added. No injuries had been reported as of Wednesday night, but firefighters were struggling to put out the flames due to the cold weather and visibility issues caused by the smoke, Foligno said. "The wind is not helping, and the cold is causing the fire to spread rapidly," he said. “The cold slows you down, and it causes it to be more difficult to fight the fire." Embers were traveling in the direction of some homes and businesses to the east of the mill, but Foligno noted that fire crews were monitoring the area. The paper inide the mill helped fuel the blaze. In a statement, the president and CEO of Soundview Paper Company, which owns the mill, said none of the approximately 200 employees who were working at the mill when the fire broke out were injured. "The full extent of the damage to our facility is not yet known, but we know the impact will be incalculable to the lives of our dedicated workers and our business as a whole," Rob Baron said. "Our top priority in the coming days and weeks will be to support our associates at Marcal whose lives will be directly impacted by this disaster," he added, calling the fire "devastating." The fire forced several businesses in the area to close early due to safety concerns and explosions were heard in the area; workers said there were propane tanks inside the building. Smoke from the fire could be seen in parts of New York City, according to the city's emergency notification system. Due to emergency personnel operating at a seven alarm fire in Elmwood Park, New Jersey, residents in NYC may see or smell smoke. Multilingual & ASL Link: https://t.co/fCMmaLTzmK. Wednesday night's fire wasn't the first one to break out at the mill, Foligno said. Earlier this month, the roof of the mill caught fire, NorthJersey.com reported at the time. "It's frequent. It's a paper mill, so it happens a lot. We're used to it, they're used to it," Foligno said Wednesday. "It doesn't surprise us but we want to make sure that it gets knocked down quickly." In a subsequent press conference Thursday morning, Foligno said the fire started in the warehouse located on the River Drive side near Summit Avenue, which houses rolls of paper. While Marcal had its own fire brigade, the blaze was too intense. Foligno stressed the impact the winds had on the grand-scale of the fire, saying thay it was a typlical fire at the plant until the wind got a hold of it. Foligno added that the fire, which has been at a "control point" since around 2 a.m. Thursday was so significant that 90 percent of the warehouse's footprint was damaged, prompting demolition crews to be on standby to remove rubble and debris so fire crews can find any remaining hot spots. While officials do not consider the fire a result of a suspicious act, arson investigators will also look into the cause of the blaze.